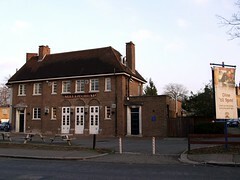 Ember Inn (Mitchells And Butlers) pub in West Dulwich. According to the 2011 Good Beer Guide it has an outside space with tables at the front, and children under 14 are not admitted (children 14 and over only if dining). Last edited 2013-09-12 22:14:47 (version 6; diff). List all versions. Page last edited 2013-09-12 22:14:47 (version 6).